I am healing more each day and slow but surely getting Christmas décor out. My oldest daughter, Nichole helped me decorate our family room mantle. As long as I can remember I have had a sweet tooth. I decided to embrace it with the gifts of this holiday season. All year long, no matter what trials we may be facing the good Lord sees to it that we get sweet snippets in our life. It's important that we reach out and grab them. Don't let them slip away! I truly believe that these snippets are not accidental! I found the old Sunbeam mixer when helping with Aunt Bunnies estate. The aqua sings to me!! I love red and aqua together. Wishing you all a wonderful and happy holiday season! It's beautiful Jann! I love the idea of sweet treats woven into the other decor. 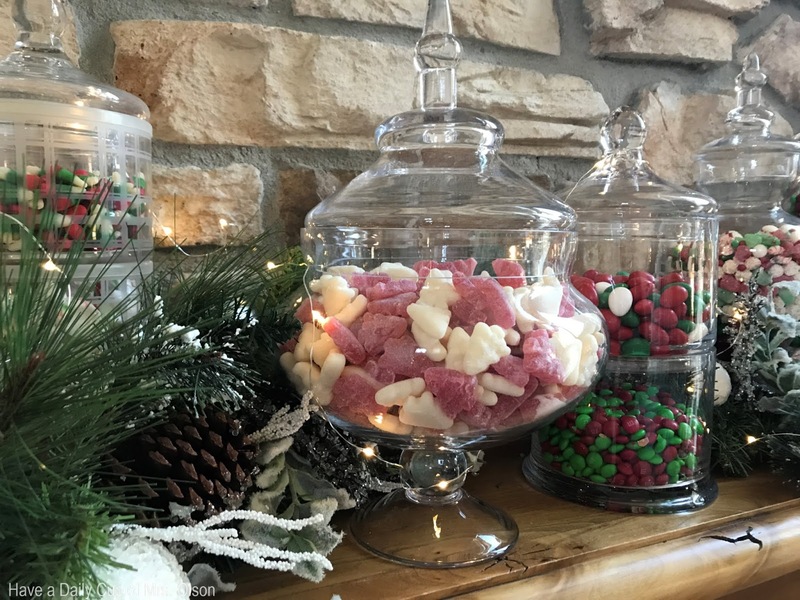 I love decorating with candy but I think yours is the sweetest of all! It looks darling, Jann. And I think extra fun you could do it with your daughter. How that makes me smile. Sending good wishes for each and every day of healing. I love your mantel Jann! I love it. With that darling mixer & stove and all that candy, it immediately made me think back to visiting Santa's Village when I was very young. Maybe 4 or 5? It was up in the San Bernardino Mtns. above L.A. I remember it ever so vaguely, but I recall a Mrs. Claus' kitchen or something like that. There was candy & good things everywhere. I still remember the smell of fudge! My mom said we about froze, it was so cold!! It looks beautiful and I'm glad you felt well enough to pretty up your home....looks tasty, too!! My husband would make quick work of that candy in about 2 days. I'm not kidding lol. Jann I am always happy to see you post! I love your mantel! 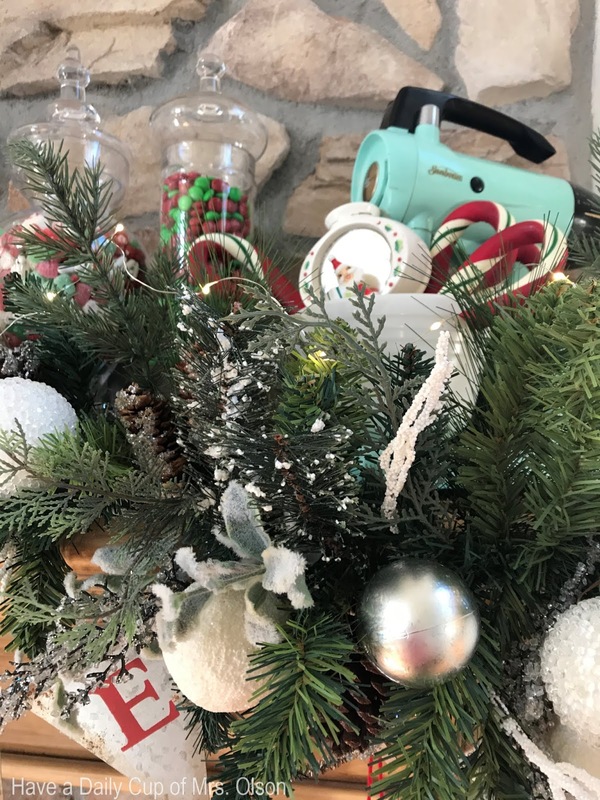 How fun to embrace the sweet part of the holidays! I'm getting my Christmas decor out and loving it!! Jann, You have had more trials than anyone should carry, yet you stay such a positive person. How wonderful for all your children and come and participate in doing the holiday "work". Rest, heal, and enjoy! All those tempting sweets would not last long with me around! Glad you continue to heal. Fun mantle. I love this joy filled season we are entering. Blessings! Jann this is SO cute and clever!! That aqua mixer drew me right in as my kitchen is aqua, red and yellow! Need to keep my eyes open for one of those. 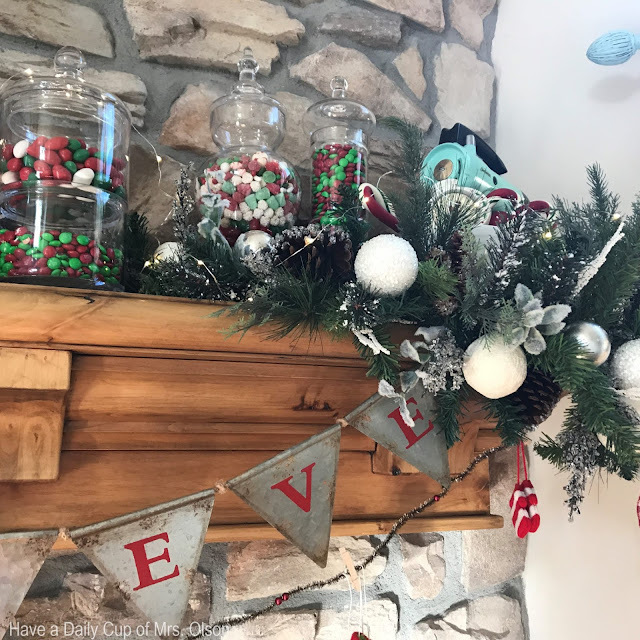 Great idea including all of the sweets in your mantle display. Your mantle is so sweet! Did I really type that? Was trying to be cute but I don't think I succeeded. I love Christmas and am right there with you. Don't take a second for granted. Enjoy life especially little things. I think Christmas is a magical time. Oh my goodness, so sweet (pun intended!). 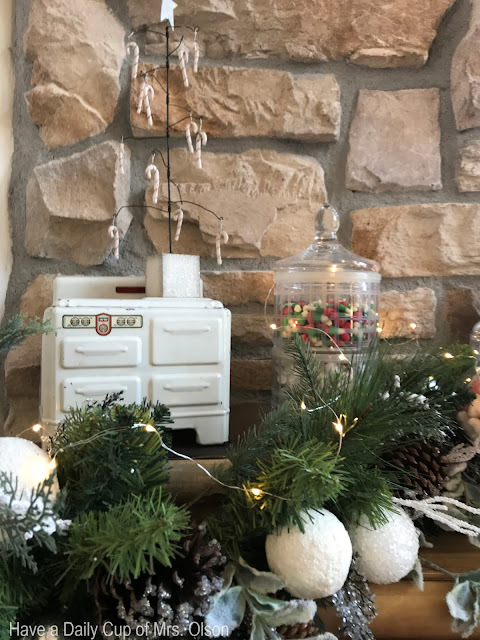 Your daughter certainly has the same knack for styling great vignettes as you, Jann. Wishing you many, many sweet snippets of life to come! Absolutely love my sweets also!! The turquoise mixer looks fantastic. Oh I love it! What a very cool idea...but coming from you, no surprise! It's a good thing I don't live close by...those sweet yummies just might turn up missing! What a blessing that you are recovering so well! Hugs! What a sweet idea! I love how you put it all together. So happy to hear you are healing well and you are in high spirits for the holidays. 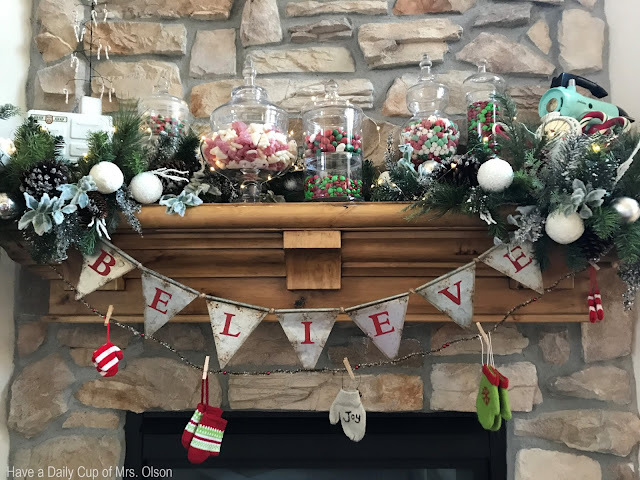 Great idea for the sweet mantle. Looks very festive. I too don't believe the 'snippets' are accidents nor do I believe in coincidences. Good to see you are back to your decorating self! Love your mantel decorations. It's adorable Jann, love it! I must say that the candy wouldn't be there for long! I have no self control when it comes to sweets! Dear Jann, I love your theme. It's amazing how all things are spiritual right? Have a beautiful holiday season the veil is just a little thinner this time of year which brings great blessings. 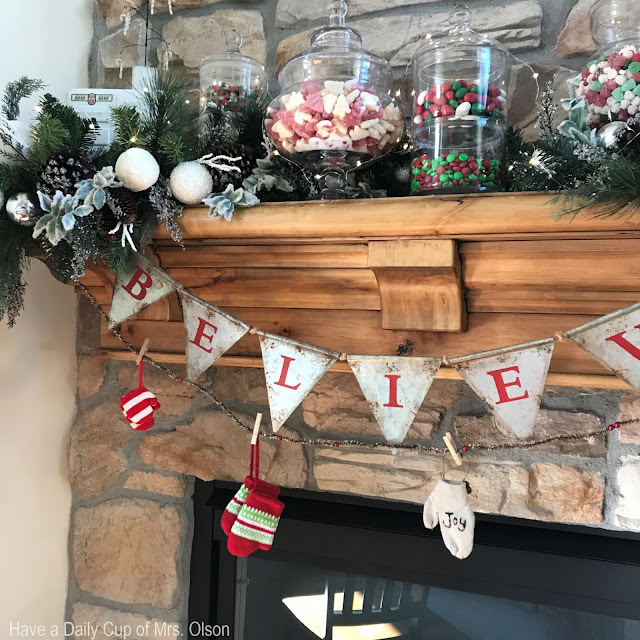 I love your sweet mantel and love that your daughter helped you create this pretty theme. I am so happy to hear you are feeling better. You have been on a long journey and it is good to see you are seeing blessing around you and grabbing hold of them. Have fun as you prepare your pretty home for Christmas. Hmmm it's beautiful and yes the sweetest things are to be enjoyed. Best to you for all days! I'm happy to hear that you're healing a bit more. I love your mantel decorated with all those beautiful glass containers with all those yummy, delicious, sweet and colorful candies. MMM GOOD! 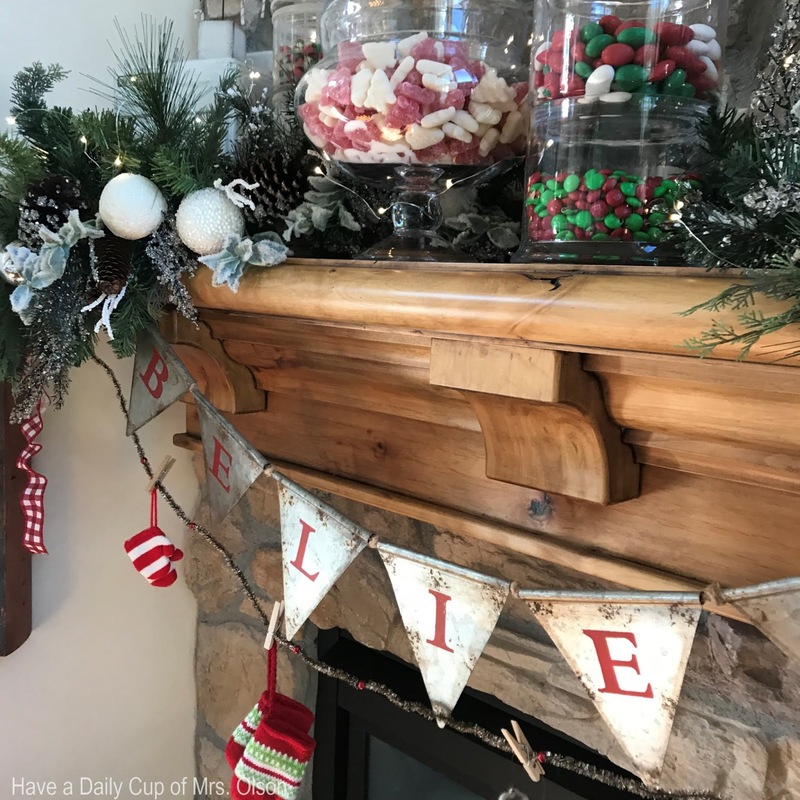 Jann, I am just smitten with your entire mantle...the sweets, all the little decor pieces and those banners. They are my weakness. Beautiful...just beautiful. I'm so glad to you hear that you're feeling well and enjoying the snippets. Feel good...hugs to you!! Jann your mantel is so pretty. 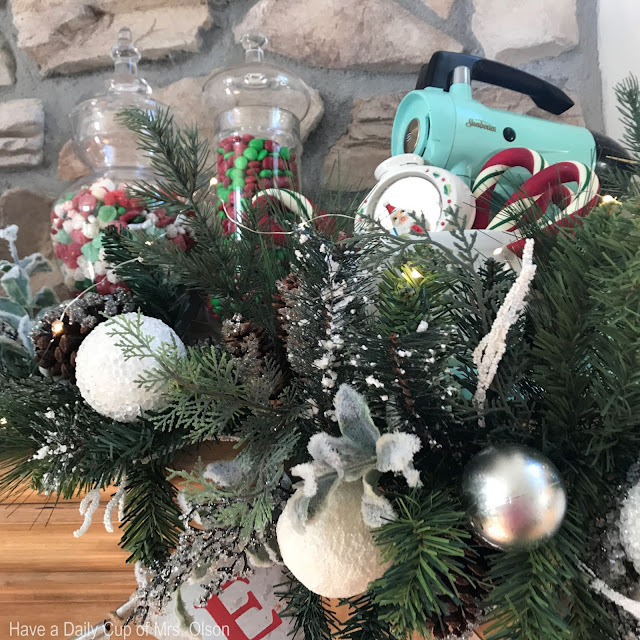 I am sure having the house decorated for the holidays is putting you in a great frame of mind. Sending love and prayers to you! I have been away for a while and so much has happened! First I want to say I am so glad you are doing well after your surgery!!!! Please continue to take it easy. And congrats on Great Grand Sweetie she is beautiful....oh and your Mantle is gorgeous. I'm so happy to hear you are healing well!! Feeling Blessed. . .No Regrets! Catching up, Summer Grandma, What's next?